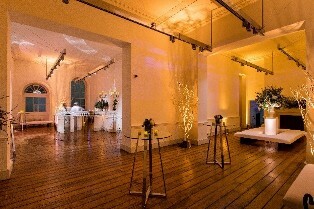 Somerset House, one of the capital’s most iconic events spaces, has won Best Christmas Venue in the London Venue Awards. 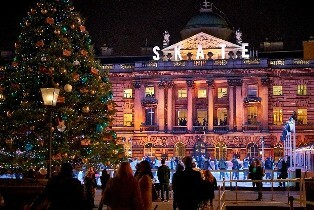 Judges commented that the setting of Somerset House, with its soaring Christmas tree and ‘magical’ ice rink, was comparable to the Rockefeller Center in New York. To celebrate their award, the Events Team are offering a festive treat of four complimentary ice-skating tickets to each event organiser who books a Christmas party at Somerset House this year. Organisers can also book a private view of the venue’s groundbreaking new ‘Peanuts’ exhibition alongside their venue hire, as a welcome addition to their Christmas party. The highly anticipated Good Grief, Charlie Brown! Celebrating Snoopy and the Enduring Power of Peanuts, opened in the Embankment Galleries at Somerset House on 25th October and runs until Spring 2019. The London Venue Awards judges also commented on the range of options and event spaces which make the venue accessible for a lot of Christmas party budgets. The East Wing Galleries, primarily used as an exhibition space as part of Somerset House’s cultural programme, is available this year for Christmas party packages for up to 300 for a standing reception. With beautiful high ceilings, grand windows and interlinking rooms, the East Wing offers a versatile and opulent space for the festivities. Partnering with Plain Jane Events, a creative events agency with over 20 years’ experience, the East Wing Galleries will come alive during this Christmas period. Plain Jane Events has extensive experience in all elements of event management, production and styling and can guarantee delivery of amazing events from concept through to completion. Music will also be provided by accredited entertainment supplier, Eight Ray Music. Alternatively, organisers can book a Christmas lunch package for up to 100 in the striking Portico Rooms - choosing from either a three-course seated lunch or a lavish buffet. Organisers booking this space can wow their guests with an al fresco drinks reception overlooking the renowned ice rink.